We can easily imagine an alcoholic with a swaying gait, dizziness, slurred speech, blurred vision, tremors and in extreme cases loss of control on urination. Now add fatigue, weakness, pins and needles, numbness and sadness to the above list. Imagine a sober person suffering from the above list of complaints 24 hours a day and 7 days a week. That is what a patient suffering from Multiple Sclerosis goes through daily! Multiple Sclerosis (MS), primarily, is an autoimmune disease (disease in which our own immune cells attack other body cells) affecting the nerve cells of the Central Nervous System (CNS). Almost everything one does; from simple things like walking to driving, from breathing to vision, to speech, to complicated dance steps; depends on proper functioning of the CNS. Every action of the body is executed by the brain impulses from the CNS to the various parts of the body. The brain impulses are generated in the nerve cells of the CNS and are carried in the form of electrical signals to various parts of the body. 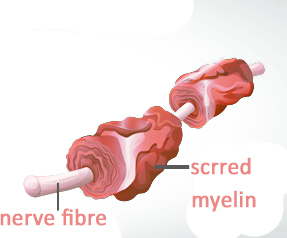 The myelin sheath (which is fatty covering that surrounds the nerve cells) insulates the electrical signals and allows them to reach their destination. However in case of MS, due to auto-immunity, the immune cells start attacking and destroying the myelin sheath. This process of demyelination (losing of myelin sheath covering) can lead to formation of scar tissue, hence the word sclerosis. The CNS then becomes unable to send and receive signals properly. Electrical signals traveling along the nerve cells may be slowed down, distorted or stopped all together. Because of the varying location of demyelination, the symptoms of MS are quite diverse. Are you or anyone you know displaying the following life-impairing symptoms? These are the initial symptoms of Multiple Sclerosis subject to confirmation by MRI brain and other investigations. Most people with MS have a relapsing-remitting disease course. The symptoms come in episodes (called a relapse) that develop over days or weeks and usually improve partially or completely (called a remission). These relapses are followed by asymptomatic periods of disease remission that can last months or even years. Most people with relapsing-remitting Multiple Sclerosis eventually develop a steady progression of symptoms, with or without periods of remission, known as secondary-progressive MS.
Other people with MS experience a gradual onset and steady progression of signs and symptoms without any relapses. This is known as primary-progressive MS.
Recurrent Urinary Tract Infections – Disrupted nerve signals to the muscles that control the opening and closing of the bladder may cause symptoms such as frequent urination, partial emptying of bladder and incontinence (involuntary passage of urine). Long standing urine present in the bladder due to partial emptying, leads to frequent urinary tract infections. Osteoporosis – Inactivity due to advanced MS and steroid medications used to treat MS lead to osteoporosis (poor bone density). Paralysis – Complete demyelination of the nerve cells to any part may cause paralysis of that particular part. Pressure sores – Continuous sitting or lying down due to the weakness in advanced MS cases leads to pressure ulcers or bed sores. Aspiration pneumonia – In advanced MS cases, when the swallowing capacity gets hampered, there is a risk of food or liquids entering the wind pipe rather than the food pipe, which causes infection of lungs called aspiration pneumonia which may be fatal. Depression – The chronic, unpredictable and life-impairing nature of symptoms pushes the patient into depression. MS may also affect the brain chemicals directly and lead to depression. Can Homoeopathy treatment for Multiple Sclerosis help? While a cure cannot be promised, the various expressions of initial MS can be managed effectively, gently and safely with Homeopathy medicines for multiple sclerosis. Early intervention with homeopathy can assist in preventing further progression to advanced MS and hence deterioration caused by the disease. To know more about Multiple Sclerosis and its Homoeopathic management at LifeForce, you may leave your contact details below or write to us at info@lifeforce.in or give us a call on +91-2266888888.